The $500 DIET: Weight Loss for People Who Are Committed to Change (Kindle Singles, 2011). Read an Excerpt. Free iTunes Audio Download. Would you rather lose a pound next week or $500? Most people given the choice would find it pretty easy to take off a pound. This simple insight is the key to a seven-step plan, The $500 Diet, that can guide you to sustained weight loss. Most diet books obsess about what you should put in your mouth. But information is not the problem. You already know that to lose weight you need to eat a bit less or exercise a bit more. The $500 Diet is a different kind of diet plan, because it doesn’t tell you how much to eat or exercise. You are smart enough—with the help of the Internet and dozens of dieting books—to figure that out. What’s unique about The $500 Diet is that it works on another dimension. It lets you change your own incentives to lose weight. New York Times best-selling author, Ian Ayres, tells you about his own struggles with weight loss, and lays out advice for how you can use commitment contracts to safely lose 10 percent of your body weight. You’ll learn about his seven-step plan to a happier and lighter you. Most important, Ayres tells you what you should do to keep it off. Most diet books are written by physicians and scientists, but Ayres is a contract lawyer and an economist who uses the tools of his crafts to help you change how much you want to eat. If you are serious about losing weight, The $500 Diet provides a simple tool that can help you commit to a healthier life. Kindle Download. Free iTunes Audio Download. 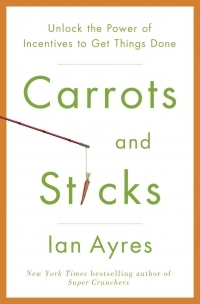 Carrots and Sticks: Unlock the Power of Incentives to Get Things Done (Bantam, 2010). Could you finally update your will if you put $1,000 at risk? If you’ve ever tried to meet a goal and came up short, the problem may not have been that the goal was too difficult or that you lacked the discipline to succeed. From giving up cigarettes to increasing your productivity at work, you may simply have neglected to give yourself the proper incentives. 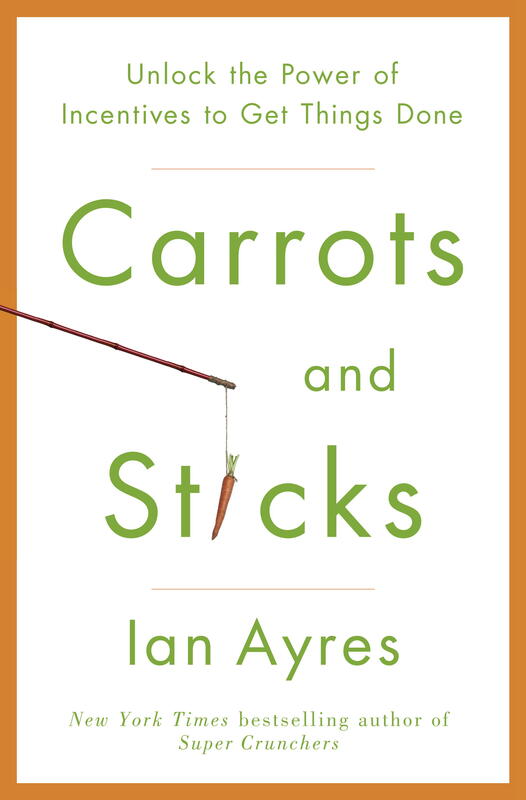 Ayres shares engaging, often astounding, real-life stories that show the carrot-and-stick principle in action, from the compulsive sneezer who needed a “stick” (the potential loss of $50 per week to a charity he didn’t like) to those who need a carrot with their stick (the New York Times columnist who quit smoking by pledging a friend $5,000 per smoke … if she would do the same for him). You’ll learn why you might want to hire a “professional nagger” whom you’ll do anything to avoid—no, your spouse won’t do!—and how you can “hand-tie” your future self to accomplish what you want done now. You’ll find out how a New Zealand ad exec successfully “sold his smoking addiction,” and why Zappos offered new employees $2,000 to quit cigarettes. 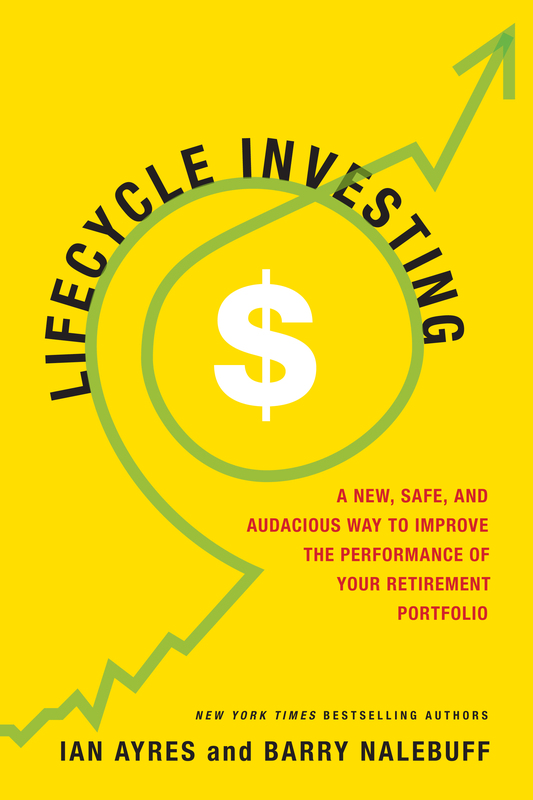 Lifecyle Investing: A New, Safe, and Audacious Way to Improve the Performance of Your Retirement Portfolio (Basic Books, 2010) (with Barry Nalebuff). 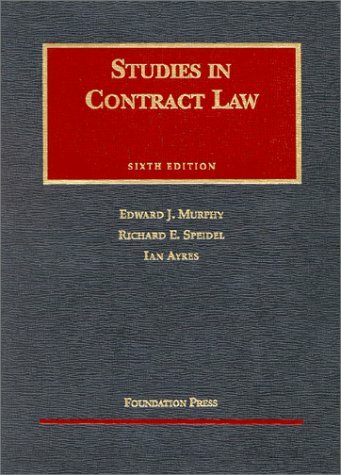 Studies in Contract Law (7th edition, Foundation Press, 2008) (with Richard E. Speidel) (formerly Murphy, Speidel and Ayres). Excerpt: How Computers Routed the Experts, Financial Times (August 31, 2007). Straightforward: How to Mobilize Heterosexual Support for Gay Rights (Princeton University Press 2005) (with Jennifer Gerarda Brown), featured in New York Times Sunday Magazine The Year in Ideas (Dec. 11, 2005). Buy a copy. Insincere Promises: The Law of Misrepresented Intent (Yale University Press 2005) (with Gregory Klass). Why Not? : How to Use Everyday Ingenuity to Solve Problems Big and Small (Harvard Business School Press 2003) (with Barry Nalebuff). Buy a copy. Also published in Portugese as “Você Pode Tudo” (Negocio Editora), in Spanish as “¿Y por que NO” (Empresa Activa), in Korean (Sejong), in Japanese (Hankyu), in Chinese (The Commercial Press), in Bulgarian (Klasika and Still), in Chinese (China Times), in Estonian (Tanapaev), in Italian (Il Sole), in Korean (Sejong Books), in Russian (Williams Publishing), and in Thai (AR Business Press). Book Excerpt: Ideas Waiting to Happen, Forbes 127 (Oct. 27 2003) (with Barry Nalebuff). Book Excerpt: A Role on the Board for the ‘Loyal Opposition,’ Directors & Boards 32 (Fall 2003) (with Barry Nalebuff). Book Excerpt: Problem Solving: What Would Croesus Do?, Darwin (Nov, 2003). Post Your Own “Why Not” Idea to our webboard for possible inclusion in our next column or see a list of other “Why Not” ideas at Forbes. 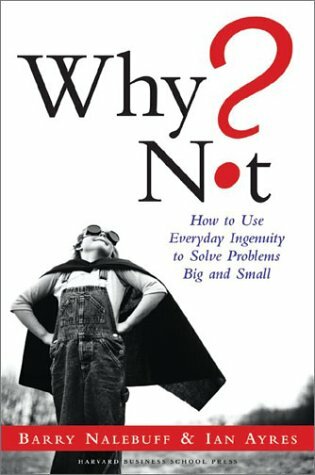 Read a law school article about the Why Not? project. 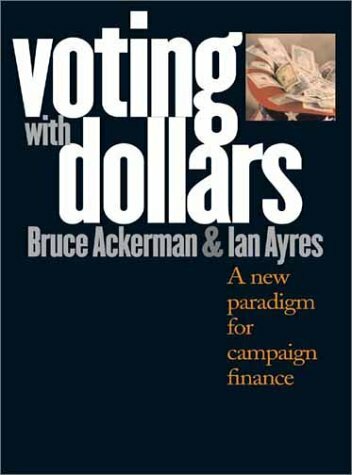 Voting with Dollars: A New Paradigm for Campaign Finance (with Bruce Ackerman) (Yale University Press 2002). Buy a copy. The New Paradigm Revisited, 91 California Law Review 743 (2003) (with Bruce Ackerman) (response to The Brennan Center Jorde Symposium Issue on Bruce Ackerman & Ian Ayres, Voting With Dollars: A New Paradigm for Campaign Finance Reform, 91 California Law Review 641 (2003)). Why a New Paradigm?, 37 University of Richmond Law Review 1147 (2003) (with Bruce Ackerman) (response to book review symposium on Bruce Ackerman and Ian Ayres’s Voting With Dollars: A New Paradigm for Campaign Finance Reform, 37 University of Richmond Law Review 935 (2003)). Join CitizenSovereignty.org and help support meaningful campaign finance reform. Pervasive Prejudice? : Non-Traditional Evidence of Race and Gender Discrimination (University of Chicago Press 2001). Buy a copy. Is Discrimination Elusive?, 55 Stanford Law Review 2419 (2003) (response to book review symposium on Ian Ayres, Pervasive Prejudice? : Unconventional Evidence of Race And Gender Discrimination (2002) and Crossroads, Directions, And a New Critical Race Theory (2002, Francisco Valdes, Jerome Culp & Angela P. Harris, eds.)). Studies in Contract Law (6th edition, Foundation Press, 2003) (with Edward J. Murphy & Richard E. Speidel). Buy a copy. 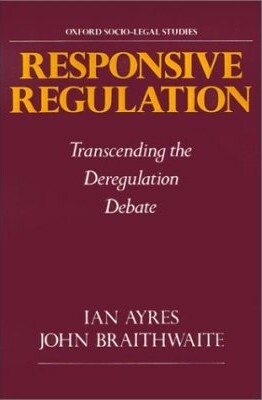 Responsive Regulation: Transcending the Deregulation Debate (Oxford University Press 1992) (with John Braithwaite). Buy a copy. Optional Law: The Structure of Legal Entitlements (University of Chicago Press, 2005). (STATA dataset) (STATA do file). Order From U. Chicago Press.